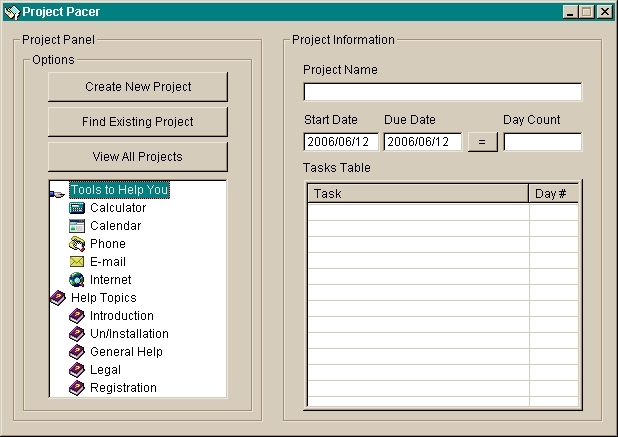 Project Pacer Project Pacer is a shareware project management software product that allows the freelancer, contractor, or anyone involved with a large project to easily break down a job into manageable daily tasks. The program works with your deadline and divides a project into daily assignments so you that can pace yourself, stay on schedule, and keep your sanity! ...... ' Pacing is the act of doing work in non-stressful amounts - yet meaningful enough that goals can be accomplished and projects can be completed. If you're a freelancer, contractor, or anyone who is faced with juggling multiple projects and deadlines, Project Pacer is for you. Project Pacer will divide a large project into a sensible daily work schedule that you can follow on the computer or print out and carry with you whereever you go. With Project Pacer, you never need to worry or stress-out over what needs to be done, what hasn't been done, or what could be done. Project Pacer takes care of all of that for you so you can concentrate on your actual work, rather than things like time. Qweas is providing links to Project Pacer 1.0 as a courtesy, and makes no representations regarding Project Pacer or any other applications or any information related thereto. Any questions, complaints or claims regarding this application Project Pacer 1.0 must be directed to the appropriate software vendor. You may click the publisher link of Project Pacer on the top of this page to get more details about the vendor.